The Trump administration announced its hiring freeze will end Wednesday, while delivering to agencies promised guidance on how they should reduce the size of their workforces in both the near and long term. Agencies will replace the freeze with a “smarter, more strategic” plan for hiring, Mulvaney said, while developing policies to reduce the size of their overall workforces. The director said not every agency will see workforce cuts, though the new guidance specifically asks agencies to develop plans to reduce employees both immediately and in the future. The presidential memorandum Trump signed to implement the hiring freeze called for OMB and OPM to issue a long-term plan to cut the federal workforce through attrition. It also allowed for agencies to fill large swaths of vacancies through a series of exemptions to the freeze. Agencies must deliver to OMB a preliminary, “high-level” draft of their reform plans by June 30, including a report on progress on near-term workforce reduction and a “plan to maximize employee performance.” In September, after discussions with OMB’s Resource Management Offices, agencies will submit their final reform plans and long-term strategies for workforce cuts as part of their fiscal 2019 budget proposals. For the June proposals, OMB directed agencies to react to Trump’s fiscal 2018 budget to identify where to make workforce cuts. The administration advised agencies to begin implementing them immediately. “Agencies should begin planning for these reductions now, as achieving associated personnel reductions takes time to implement and realize savings,” Mulvaney wrote in his guidance. OPM will provide “streamlined templates” to enable agencies to request Voluntary Early Retirement Authority and Voluntary Separation Incentive Payments, or buyouts, that enable the human resources agency to approve the requests within 30 days. Mulvaney encouraged agencies to begin “eliminating unnecessary vacant positions” immediately, as well as to review whether employees currently on administrative leave because of performance or misconduct should be allowed back to work. Mulvaney discouraged federal employees from feeling upset about the pending cuts, saying that ridding the workforce of unnecessary workers and poor performers will create more opportunities to recognize top civil servants. 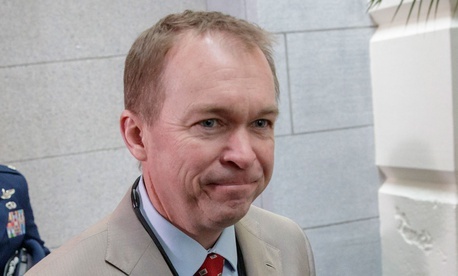 Aside from the Environmental Protection Agency, where Trump, through his budget, has already proposed eliminating 3,200 jobs, Mulvaney said OMB will not prescribe specific targets for cuts and declined to elaborate on how layoffs may ultimately factor into their plans. He acknowledged some of the reforms the administration would like to see would require congressional approval, but said in some cases agencies can act more quickly. Before agencies submit their long-term plan for cuts, they must first turn in proposals to maximize employee performance. Those plans must include hiring and retention reform proposals, as well as address the removal of poor performers. OMB told agencies to “provide transparency” for the performance improvement plan process. OMB's guidance provides for additional training for Senior Executive Service members and other supervisors on “managing employee performance and conduct.” Agencies must tell OMB how they will hold managers accountable for employee performance and submit a plan to create “manager support boards” that will provide expertise to supervisors on employee and labor relations. Mulvaney said Tuesday the guidance demands that agencies examine broader personnel reform issues. He added such an approach would ultimately improve employee morale. “One of the frustrations government workers have is we don’t reward those who do a really good job and we don’t punish those who do a really bad job,” Mulvaney said.